(a) Check the sight glass on the cooler refrigerant liquid pipe A.
Blower speed control switch is at "HI"
Temperature control dial is at "MAX. COOL"
*: Bubbles in the sight glass with ambient temperatures higher than usual can be considered normal if cooling is sufficient. (a) This is a method in which the trouble is located by using a manifold gauge set. Read the manifold gauge pressure when these conditions are established. Temperature control dial is at "COOL"
During operation, pressure on low pressure side cycles between normal and vacuum Moisture in refrigeration system freezes at expansion valve orifice, causing a temporary stop of cycle. However, when it melts, normal state is restored. 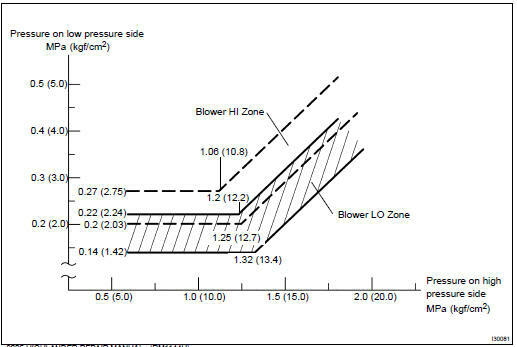 If the indicated pressure value is close to 0 when connected to the gauge, create a vacuum after inspecting and repairing the location of leakage.